This essay on the Medical Report of the Atomic Bombing in Hiroshima, 1945 was originally published in Hidden Treasure: The National Library of Medicine, 2011. 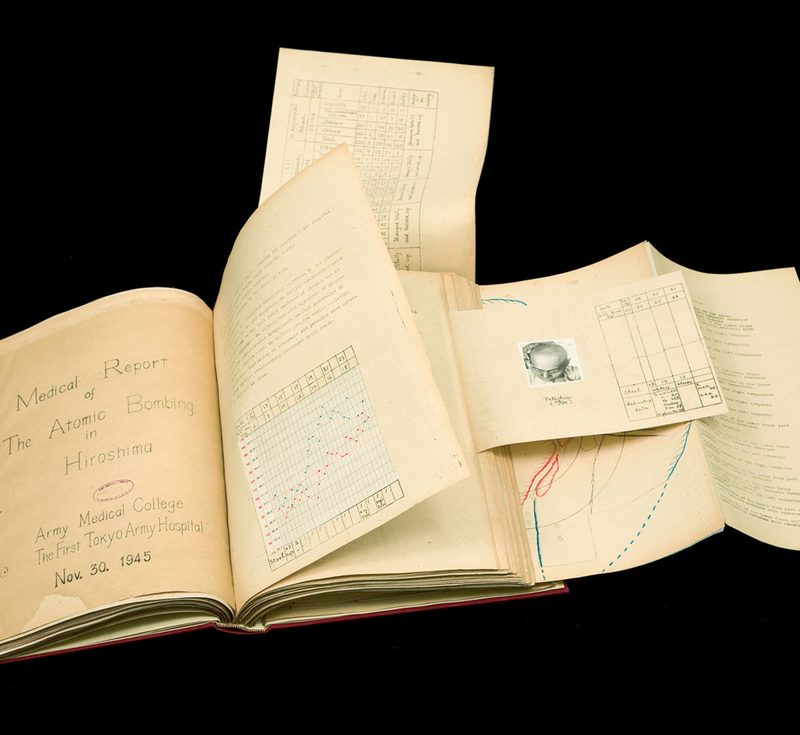 The report was authored by Imperial Army Medical College and First Tokyo Military Hospital and consists of bound mimeographs with insert charts, diagrams, and photographs; 10 1⁄4 x 141⁄2 in. (26 x 37 cm). It is republished here today in honor of the 70th anniversary of the bombing of Hiroshima. The atomic bomb exploded over Hiroshima on August 6, 1945. Some seventy thousand people died that day—upwards of a quarter of the city’s population. Another seventy thousand were injured. Many would die from wounds, burns, and radiation poisoning over the next few weeks. The city was devastated, its doctors and nurses scattered or killed, its hospitals and clinics destroyed. Two days later, the Imperial Army Medical College and the First Tokyo Military Hospital sent doctors into the chaos of destruction. Over the next months these men were the mainstays of care—and data gathering and analysis. Though the American medical investigation of the atomic bombing is well known, Japanese doctors provided the earliest and most detailed studies. Americans did not enter Hiroshima in any numbers until mid-October, forestalled by a hurricane and the formal commencement of Occupation. At that point, three separate American investigations (from the Army Medical Corps, Manhattan Project, and the navy) sprang up. Coordination was needed and, on October 12, the supreme commander for the Allied Powers, General Douglas MacArthur, set up the four-party “Joint Commission for the Investigation of the Effects of the Atomic Bomb on Japan” (the Japanese were the fourth party). The commission’s work was completed by mid-1946 and the supporting materials shipped stateside.To continue the research, President Truman established the Atomic Bomb Casualty Commission. It remained in existence until 1975. This report—entirely a Japanese production—preceded almost all of that work. Issued in November 1945, when the Joint Commission had only just begun, the mimeographed typescript of several hundred pages has a hand-lettered title page and glued-in tables. Its roughness evokes the dire circumstances of its production. Amid the catastrophe the Japanese army doctors labored to describe what they had seen and done, diagrammatically, quantitatively, professionally, and objectively. In charts, tables, and case histories, they laid out the symptoms of radiation sickness and patterns and circumstances of death. They prepared a hand-colored map of Hiroshima, distinguishing completely destroyed areas from those partially destroyed; drew the smoke cloud that the A-bomb left over the city; made diagrams of shock-wave patterns; described the treatments they administered; and inserted photographs of wrecked buildings and people, most famously a photo showing the pattern of a print dress rendered in flesh. And they provided case histories, such as the example of K. Ishida, a twenty-five-year-old officer. On the very day of bombing appeared vomiting…Felt sore throat…Was admitted to the…hospital. The tongue was coated brownly & had tendency of bleeding. Both tonsils were swelled. Scalp-hair were sparsely. Small petechias [red spots] were generalized on the whole body surface. On 29/VIII appeared bloody stool & epistaxis [nose bleeding], which was difficult to stop. On 1/IX appeared disturbance on consciousness…Died on 2/IX. Tellingly the Japanese medical officers wrote their report in English. They were already cooperating with the American military but perhaps had a larger goal: to bear witness to the scope of death and devastation in a form that could be circulated to the wider world. Paul Theerman is former Head of the Images & Archives section in the History of Medicine Division of the National Library of Medicine and is currently Associate Director for NYAM’s Center for the History of Medicine and Public Health.